How Lord of the Rings’ Gollum Changed the Course of SFXOne of the many hands who worked on Andy Serkis’s groundbreaking mo-cap performance looks back on the process of creating a new breed of CG character. Andy Serkis on His Most Groundbreaking Motion-Capture PerformancesThe trailblazing performance-capture actor analyzes four key roles and catalogues the great leaps forward in mo-cap technology over the last 18 years. Warner Bros. Sells Andy Serkis’s Live-Action Mowgli to NetflixThe Andy Serkis–directed adaptation will now premiere next year instead of this fall. Watch the Trailer for Mowgli, Previously Known as Jungle Book: OriginsComing to Netflix December 7. 6 Pictures of Caesar From Planet of the Apes With a Caesar HaircutThis post features famous computer ape Caesar with the ’90s haircut known as the Caesar. Pretty self-explanatory, really. 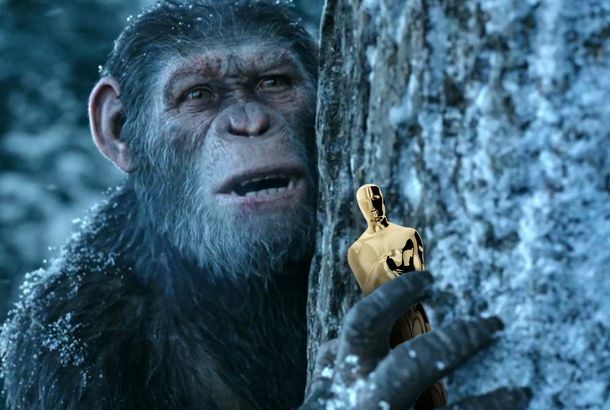 Could War for the Planet of the Apes Finally Win the Series an Effects Oscar?The series is a special-effects triumph, but has gone zero-for-two on Oscar night so far. War for the Planet of the Apes Isn’t the Apocalypse Now Remake It Wants to BeIt’s an awesome, dull movie that manages to be both alienating and sappy. Breathe Trailer: Try Not to Weep As Andrew Garfield and Claire Foy Fall in LoveDirected by Andy Serkis. Cannes: Andy Serkis Says His Jungle Book Will Be Scary and ‘Quite Dark’In a way that’s different than Jon Favreau’s. Alfonso Cuaron Helping Andy Serkis’s Jungle BookThe Warner Bros. version has been pushed back to October 2018. Andy Serkis to Direct Motion-Capture-Based Animal Farm AdaptationIt will be mostly motion capture, obvs. Tilda Swinton Is Ready to Do That Duet With Andy Serkis At Patton Oswalt’s suggestion. See Andy Serkis Act, Before the CGIYou could literally put Andy Serkis in a monkey costume and we’d still be tearing up by the end of this scene. David Edelstein’s Favorite Performances From 2011And a few of his worsts, as well. Andy Serkis Signs Apes Sequel DealHe’s the first returning player to be locked in. Watch the Second Video Dispatch From The HobbitFeaturing pretty scenery and Andy Serkis taking his post as the second-unit director. The Hobbit’s Second Unit Will Be Directed by GollumAlso known as the actor Andy Serkis. Peter Jackson Announces Hobbit CastIt’s a nice distraction from that nasty battle he’s having with a New Zealand union. Sean Penn and Robert Pattinson to Join the Circus?Plus: Rob Marshall! Steven Spielberg! Danny Boyle! Idris Elba and Cuba Gooding Jr. Join the Juice CrewPlus industry news on Andy Serkis, Alan Jackson, and Emmy Rossum.